15 comments on "Someone's Mother-In-Law's Steamed Chocolate Cake"
wow! your cake looks so stunning!Really delicious thats make my mouth water dripping..Btw, instead of using conola oil, what else i can use? I've tried this with sunflower oil, margarine and melted butter too and it all worked well. Apart from the fact that if you wanna make this using melted butter, either place it covered in room temperature or warmed it back in the microwave(I personally dislike this a lot. The thought of microwaving my cakes, ewwww!). Margarine is alright too. Olive oil is a big no-no. Use mild oil like corn oil and vegetable oil. Hope this helps a bit. Happy trying! Have u try your recipe to a small cake like a cup cake? Apparently, I think she did not notice that both recipe are the same and she had made it into cupcakes. She also claimed that she accidentally underbaked them and they came out awesome, like some sort of molten chocolate lava cake. However if you want this to be thoroughly cooked, I would suggest 30mins on medium-high heat. This cake batter is very watery. I really hope you enjoy baking and whipping up good comfort food as much as I do. It helps me a lot in releasing my stress but baking could really test your patience sometimes when things don't turn out well. I have a lot of baking pans and some are springform, some are not. I use springform when I'm making cheesecakes, delicate tortes, flourless cakes and flans. These are some examples where you can't turn them out. I have springform pans from 8inch onwards up to 12inch. Some sellers might tell you their springform pans are leakproof but in reality they are not. You just need to cling wrapped and foiled the outer side of the pan when you are making very watery cakes or when recipe calls from cheesecake/caramel flans being steambake or waterbath. That's the bad side about springform. 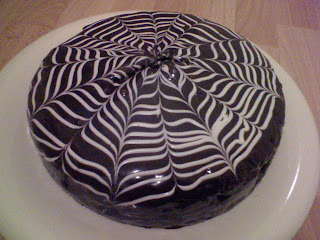 However, it's good to own one for the professional look cakes and tortes. Sometimes, I use my largest pizza pan base as my pizza tray. It's 30cm in diameter and makes a pretty good pizza tray. That's my two cents about what I do and what I know about springform pans. Finally, a very important point to remember is to grease the inner sides and base of your pan with butter. Line it with perfectly fitted baking paper as an insurance for easy removal. Even when your pans say non-stick, just lightly butter and line them. My personal tip, when a recipe calls for a whole bar of butter, plop that nto the mixing bowl and use the butter wrapper to grease your pan. If recipe calls for 1/2 bar of butter, just measure it out and grease your baking pan with that piece of butter before plopping it into your mixing bowl to mix with other ingredients. Really hope this helps to you and some others who emailed and ask me about springform pans too. Thanks you so much. You're really kind to answer them. Appreciate it(: Anyway, What brand of butter you usually use to bake cake? No worries and glad I could help. I'm currently in Australia and I'm afraid the butter brand might be different. In Malaysia, brands like SCS and Golden Churn; they are really good. In Australia, we have the cheapest Black & Gold and also the good Devondale. Devondale is my common preference. 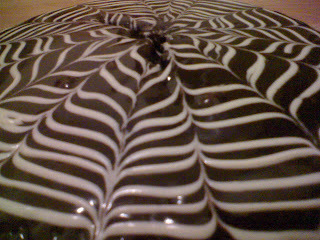 Thank you so much(: Did you used springform pan to bake the steam moist chocolate cake? or just normal cake tin? 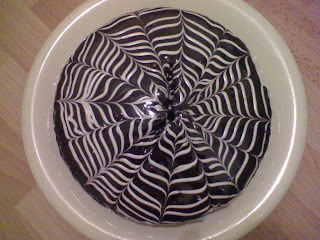 I really had a hard time removing the cake from its tin after i bake it. 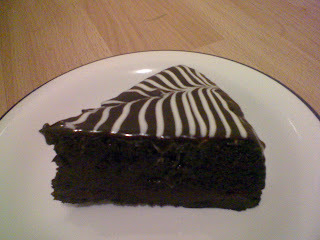 Nope, I've used a 9 inch round silicone pan to bake this as it was very watery. And I steamed the cake, not baked them. This way of steaming cakes results in a very moist cake. Just remember to grease and line the pan well. Shouldn't be a problem really. For me, I have the luxury of using coking spray for all my bakes so I get a very even coating of grease before lining them. Try again and you'll succeed over time. hey quinn i have the same problem with keryn. i wonder how to transfer the cheese cake out from the springform pan??? i press the biscuit base to the pan then pour in the cheese mixture and put it to chilled and the next day i really don know how to take it out. I got 2 springform pan. like 1 is plain and 1 the base is just sort of like perforated. What is the difference? Which type is better?